A soothing, all-natural bubble bath! 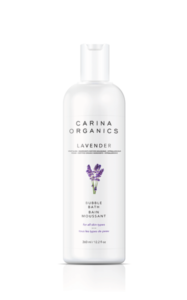 Certified organic plant, vegetable, flower, and tree extracts keep your skin moist, soft, and naturally beautiful. Soak and relax in lavender, sweet pea, unscented or baby (extra gentle) bubble bath! For those sensitive to scents we have Unscented and Baby (Unscented)! Ingredients: **Filtered Aqua, *Elaeis guineensis (palm) oil, *Cocos nucifera (coconut) oil, **Vegetable Glycerin, **Pinus banksiana (pine) extract, *Matricaria chamomilla (chamomile) flower extract, *Urtica dioca (nettle) leaf extract, *Taraxacum officinale (dandelion) leaf extract, *Trifolium pratense (clover) flower extract, *acetic acid (apple cider vinegar).